(Nanowerk News) Stars do not accumulate their final mass steadily, but in a series of violent events manifesting themselves as sharp stellar brightening. According to this theory of Eduard Vorobyov from the University of Vienna, stellar brightening can be caused by fragmentation due to gravitational instabilities in massive gaseous disks surrounding young stars, followed by migration of dense gaseous clumps onto the star. This "Cannibalism", as Vorobyov describes his model prediction, was verified for the first time thanks to advanced observational instruments. 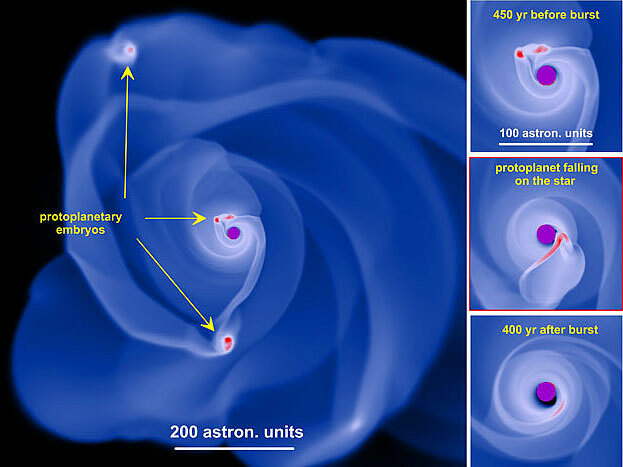 The results are now published in Science Advances ("Circumstellar Disks of the Most Vigorously Accreting Young Stars"). Stars are born inside a rotating cloud of interstellar gas and dust, which contracts to stellar densities thanks to its own gravity. Before finding itself on the star, however, most of the cloud lands onto a circumstellar disk forming around the star owing to conservation of angular momentum. The manner in which the material is transported through the disk onto the star, causing the star to grow in mass, has recently become a major research topic in astrophysics. With the advent of advanced observational instruments, such as SUBARU 8.2 meter optical-infrared telescope installed in Mauna Kea (Hawaii), it has become possible for the first time to test the model predictions. Using high-resolution, adaptive optics observations in the polarized light, an international group of astronomers led by Hauyu Liu from European Space Observatory (Garching, Germany) has verified the presence of the key features associated with the disk fragmentation model -- large-scale arms and arcs surrounding four young stars undergoing luminous outbursts, including the prototype FU Orionis star itself.